Lightning Photos from TheRagens.com, August 2003. 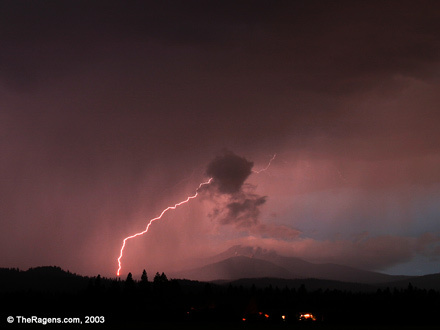 Photograph Notes: The lightning strike that we captured from Black Butte Ranch in central Oregon, as shown below, was one of many that evening. Recently, there have been two forest fires caused by lightning storms in the near vicinity -- one, the Cache Lake fire of 2002, received national attention. This photo is looking directly west towards the mountain named Three-Fingered Jack. This particular lightning picture does not show many branches but it ran straight from the cloud to the ground and, if you look closely, the color just looks "hot" where it touched the ground.